This was a tea I received as a gift from a friend who went to Europe this year! It came in a cute souvenir-friendly tin. The pricing I found online was for the tea in a tin that was not illustrated as below. 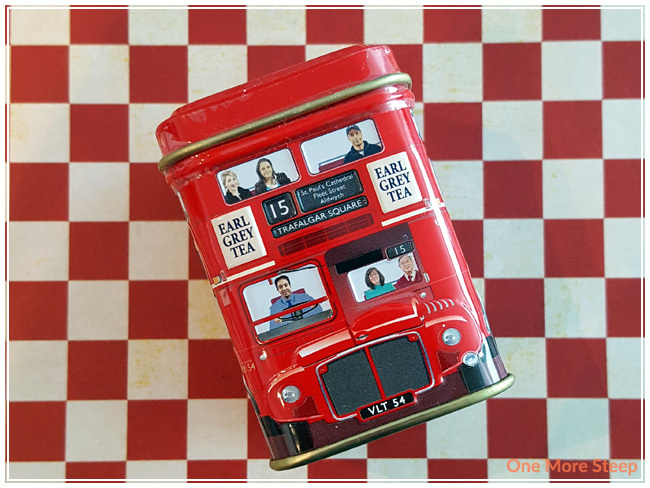 Ahmad Tea’s Earl Grey came in a delightful little tin that’s illustrated like a double-decker bus – complete with people and fun little details. The windows of the bus actually dip in a little, and some other details, like where the engine of the bus might be, stick out. The bottom of the tin is where there is information about the tea (the company, ingredients, and best before date). The tin itself seems to be quite air tight – the tea is loose in the tin and I cannot smell the tea when the tin is closed, an excellent design of the snug lid fit on this tin. The Earl Grey smells very strongly of the bergamot flavouring, which seems to overpower the black tea base. The tea leaves themselves seem to be generally quite small. 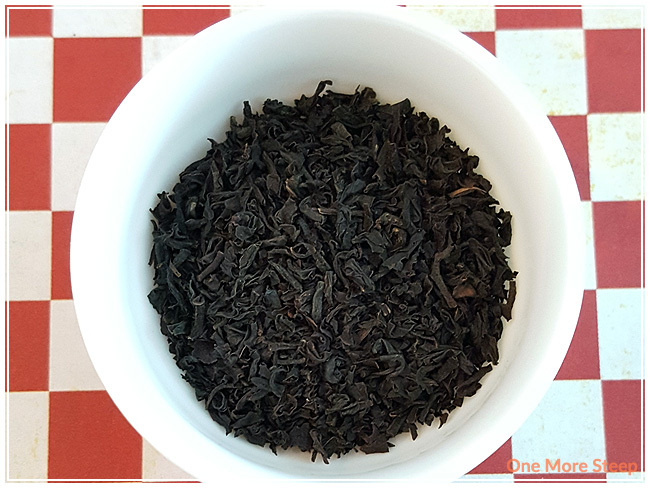 The ingredients of this Earl Grey are: black tea and bergamot flavouring. The bottom of the tin states that it is “pure Ceylon tea packed in Sri Lanka”. I steeped Ahmad Tea’s Earl Grey in boiling water (100C/212F) for 4 minutes. If you are ever at a loss for how long to steep what teas, I do have a list of steeping times on One More Steep. Earl Grey steeps to a deep clear orange-brown. There’s a strong bergamot fragrance to the tea itself. I can definitely taste the citrus in the tea, and it is quite strong in flavour. I find that it does compliment the black tea base fairly well, although it could be a little bit less strong. 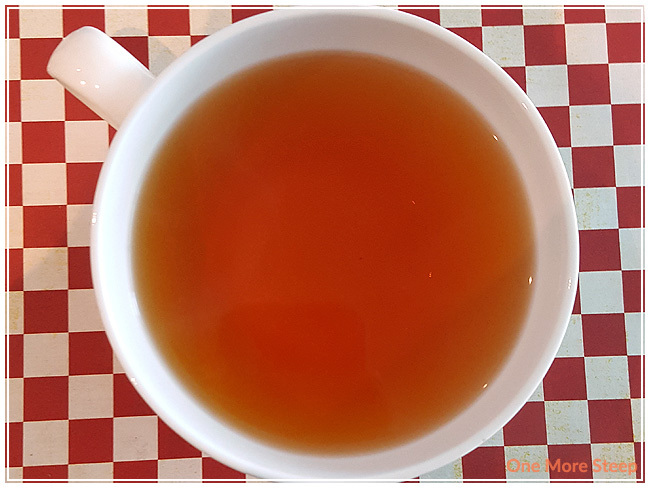 I found that after adding a bit of sugar and evaporated milk, the bergamot flavour was toned down and I was able to taste the black tea base a lot more. I attempted to resteep this Earl Grey, but found it to be significantly weaker. The first steep was the best, and I wouldn’t recommend one more steep for this tea. I thought that Ahmad Tea’s Earl Grey was just okay. I am usually a pretty big fan of Earl Grey teas – there’s just something about a good black tea with bergamot that makes me smile. While this tea was enjoyable, I found that the black tea itself was a bit lacking. This would likely be due to the fact that the bergamot flavouring is just so strong in comparison that there’s no competition between the bergamot and the black tea itself. I think this tea definitely benefits from having evaporated milk or cream, as it helps tone down the strong citrus flavours and allows the tea to actually make itself known.